The Lady C Podcast show deals with real life, real women and real issues. This show empowers women to grow in their relationship with Christ and to never forfeit their God given purpose. 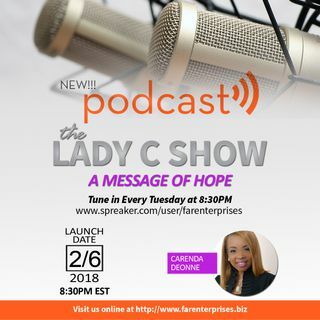 The Lady C podcast show inspires and teaches women not to live life on the premise of impression, but live life on the promise of impact. This is accomplished on the principles of faith, favor, fortune and fortitude. Episode 61 - The Lady C Show Happy New Year! We Are Gearing Up For the Conference! The Countdown Has Begun!